The Department of Transport declined to comment on a report in today’s Financial Times. MIDDLE EASTERN AIRLINE Etihad is reported to have approached the Irish government to buy its 25 per cent stake in Aer Lingus. The Financial Times cites sources as saying that an approach has been made but it is not clear how far the talks have progressed or whether any deal is likely. The Department of Transport told TheJournal.ie this afternoon it had “no comment” on the story. The Minister for Transport Leo Varadkar said last month that the government would be willing to sell its stake in the national carrier but that it would not sell for less than €1 per share which would value the the stake at around €132.4 million. 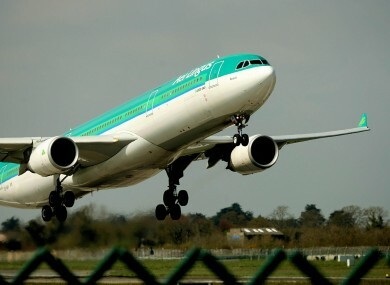 Later, Tánaiste Eamon Gilmore said there had been no decision taken on whether or not to sell the government’s stake in Aer Lingus. The FT also cites analysts as predicting that the more likely buyer of the 25 per cent stake would be the International Airlines Group, which is the parent company of British Airways. Email “Etihad approaches government over stake in Aer Lingus - report ”. Feedback on “Etihad approaches government over stake in Aer Lingus - report ”.